WhatsApp is too much popular free to use application which is used to send instant messages on smartphones. But most of the person have to avoid given common mistakes on WhatsApp. WhatsApp is an important part of our life. Lot of person share his important and personal things with his friends, family members and others on WhatsApp. This is not correct thing you must have to take few precautions during working on WhatsApp. WhatsApp used by the lot of person on daily basis around the world. There are lot of interesting and useful features make this app too much popular. But during using the WhatsApp we have to do few common mistakes which is not correct for us. 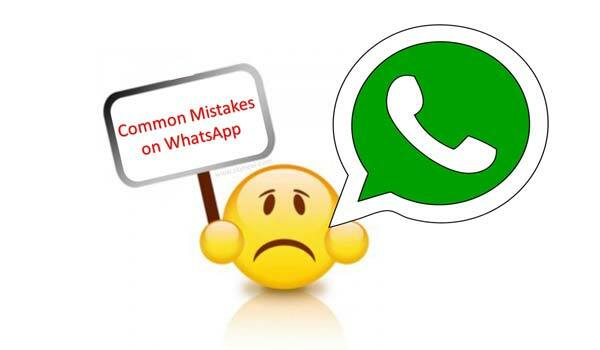 You must have to avoid these given common mistakes on WhatsApp. During using the WhatsApp we have to do few given common mistakes on WhatsApp. You must have to know during using the WhatsApp you have to take few precaution, let’s start. Lot of person share his personal information like mobile number, address, email id, bank detail, debit or credit card number, password and other things. This is not right thing to share your personal detail on this platform. You must have to avoid to share these things on WhatsApp. During using the WhatsApp if you want more security then you have to apply password on WhatsApp. You can use any third party app to apply the pin or pattern password to protect your WhatsApp. If you lost or forgot your phone at any place then due to password protection your important information safe with others. You can block all those strangers which are not in your phone address book. Lot of person send spam messages on your smartphone, on regular basis. There is no need to share any confidential information with these person on WhatsApp. You must have to avoid these guys and block unknown person on your WhatsApp account. If you don’t want to show your online status on WhatsApp then you must have to turn off last seen from WhatsApp. If this option turn on then your other persons can check your last seen status any time. Most of the person set either everyone or My contacts option to view his profile phone on WhatsApp. Anyone can download your WhatsApp profile photo on his smartphone. If you don’t what to share or allows those uses to download your WhatsApp profile then set “Nobody” option on profile photo. If you lost your phone then active your WhatsApp with another phone. When you active your WhatsApp at another device it will be automatically deactivate from old device. Lot of person use WhatsApp web to run his WhatsApp account on Laptop or Desktop PC. After finish your job at Laptop or Desktop PC always remember to logout your WhatsApp account from WhatsApp Web.